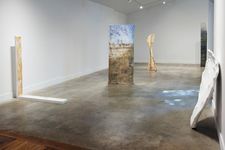 “The collusion of body and memory and the slippage between visual and physical sensation are at the heart of Tremblay’s work. 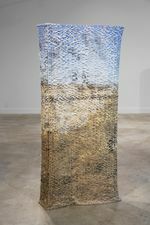 In her soft sculpture Drop, Tremblay has played materially with the experience of spatial memory by weaving together photographs of different landscapes printed on fabric. 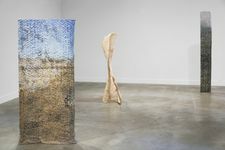 As one moves in relation to the work, the landscapes vacillate between merge and disintegration, mimicking both the effects of mirage and those of memory. This moment of conceptual innovation subtly suggests the way events and feelings from our past blend together almost imperceptibly, permeating our sense of place. For Tremblay, humans and objects press up against each other leaving imprints, like fingers in moist dough. The mutually affective interactions between humans and the material world are intimate, illogical, suffused with eros. 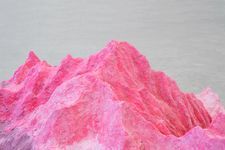 In another sculpture, Salty Feel, Tremblay has mixed up a batch of homemade play-dough to construct a small-scale replica of Mont Blanc, the highest peak in the Alps. Its title makes reference to the strange coincidence of multiple levels of sensory perception with personal memory. 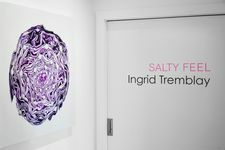 Ingrid Tremblay is a French Canadian artist, originally from Montreal and currently based in Austin, Texas. 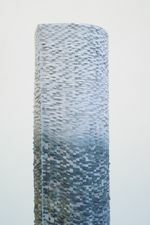 She is an MFA candidate in Sculpture + Extended Media at The University of Texas at Austin. She additionally holds a BFA from Concordia University (Montreal), a B.Sc. and a Master of Speech-Language Pathology from the University of Montreal. She has been awarded several fellowships through The University of Texas at Austin and she is a recipient of the Bourse Fonds de Recherche Québec Société et Culture. She is the 2017 winner of the Eyes Got It! competition. She completed residencies including Vermont Studio Center (USA), ACRE (USA), Terra Vivente Art Studio (Italy) and 59 Rivoli (France).